Excellent. Hilary was very helpful. We enjoyed our stay. It was what we needed to meet up with some extended family to visit our sons at UVa. It was convenient to grounds and to other restaurants and activities. Great! All professional in dealings/conversations. Very accommodating! Property is in a great location. Can be loud late at night/early morning due to "foot traffic". There was also some sort of running race, and the concession tent was located right under our front window on the mall. At 7:30 a.m on Saturday morning, it was very loud with people shouting, etc.. Working with anyone at stay charlottesville was always perfect either by phone or email. LOVED THE HOUSE. LOCATION WAS GREAT. PARKING BEHIND IS VERY NICE. FENCED YARD IS A DEFINITE PLUS WHEN YOU HAVE A DOG. HAVE NO COMPLAINTS ABOUT ANYTHING. WILL STAY AGAIN NEXT TIME IN CHARLOTTESVILLE. The property was very convenient to the Downtown Mall and the neighborhood was very walkable (important to us). The yard was great for our dog, who always travels with us. This property would be difficult for anyone who has health or mobility problems. Carrying luggage and/or groceries up the 3 flights is not easy. Loved working with your team. From initial email to final visit, I felt very taken care of! loved the condo- it was very spacious and I know we all slept very well- the mattresses were very comfortable! Very centrally located for everything we had planned. The folks at Stay Charlottesville were very helpful in booking my stay. They worked with me to choose the perfect spot based on what I was looking for and we were super happy with the place we booked! 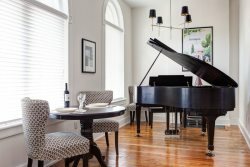 We had such a fabulous time during our stay in the Cabell Cottage in Charlottesville! It was just perfect for our relaxing girls weekend! The cottage was well furnished and beautiful and the screened in porch was fantastic for relaxing with a cup of coffee in the morning. We also really enjoyed the fireplace and cozy rooms - the house had the feel of a rustic cabin with all of the comforts of a modern home. We will be back! Great house in a primo location for walking to the downtown mall or Belmont business district. Very nice experience with no issues. very nice layout with bedrooms on second floor. Excellent walkability. Our only complaint is the RAIN. However, great place to sit around in and do nothing. We had two issues while we were there and both were resolved quickly. This is our third time to rent a StayCharlottesville property and you are awesome! The house is beautiful - lots of windows with beautiful views and a great screened porch for morning coffee. The location is perfect - a short drive from town but very private with a fenced backyard for our dog and a great full circle drive in the large front yard which would be great for kids. The only thing I would caution others about is that it is very noisy in the house. It is open to the upstairs with windows in each bedroom overlooking the family room so lights on downstairs light up the bedrooms. The sound carries- both the TV and any conversation etc. so it was difficult with a new baby in the house. Loved the keyless entry! Nice walk to downtown area. Perfect location; kitchen could use more equipment: cutting board, more knives, etc. ; otherwise, we had a delightful time in the spacious and comfortable apartment. Excellent. When the toilet handle was broken at check in, we called the office to report the problem and Travis came and fixed it immediately. He was also very helpful in suggesting a broker for us to speak with regarding our interest in possibly buying a vacation property. We loved staying in the Carriage House. We really appreciated the pet friendly policy. The apt. is very comfortable and private. The back deck is a great amenity. Being able to park in the garage was also nice. It was close to downtown Charlottesville but a bit too far to walk at night. Loved the walkability of the property, as well as the amazing windows throughout the house that allowed the light to come through and made the house feel brighter and homier. I spoke with a few members of the team and all were fantastic! They were helpful with restaurant and activity recommendations and answering all the questions I had about various properties. Perfect location to walk downtown, university and Belmont. Short drive times to wineries, Monticello, etc. Football game, swim meet, farmers market, eating and drinking.